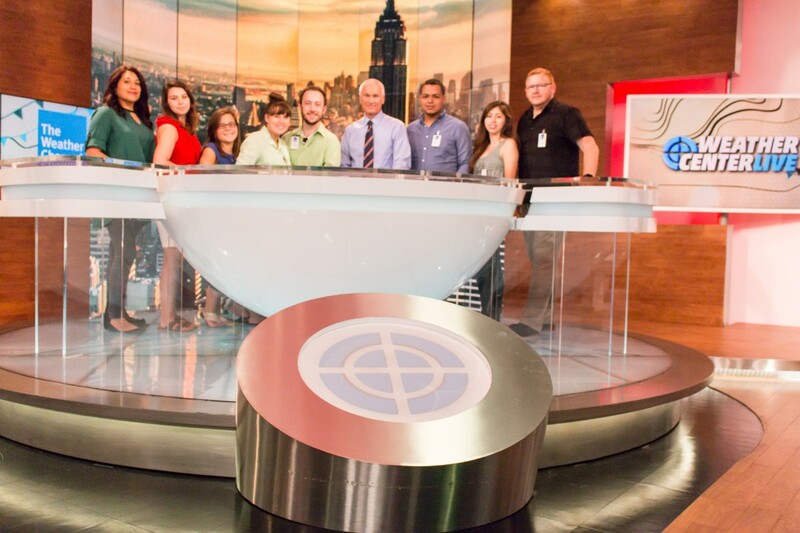 On Saturday, September 12, the team took a tour of the Weather Channel in Atlanta, GA. Their host was Meteorologist Nick Walker, who graciously took time out of his busy agenda to meet the Abante colleagues, show them around the studio, and share his story. Nick Walker is a rock star meteorologist and musician with more than 30 years of broadcasting experience. We say rock star not just because he’s awesome, but he’s also a singer and songwriter. He has recorded several albums of original music, made cameo appearances on “Late Night with David Letterman” and “The Daily Show with Jon Stewart,” and in the finale of “The Gilmore Girls” Sally Struthers’ character Babette confessed that she is a “Nick Walker fan.” Nick is also the author of Sing Along with the Weather Dude, a book and CD for children and “Don’t Get Scared, Just Get Prepared,” a CD of weather songs to teach severe weather preparedness. If that’s not enough, he also currently serves on the NWA Broadcast Committee as past chairman. Being in the studio, and seeing first hand, how the world gets their weather forecast, was fascinating, but what the colleagues enjoyed the most was being able to hear Nick Walker talk about his life story as a journalist and meteorologist. Nick’s walk has truly been an inspiring journey of faith.